From four-poster beds and ancient fireplaces, to free-standing bathtubs and unbelievable views, here’s your chance to take a closer look at the splendour awaiting you when you come to stay with us at the spectacular Lough Rynn Castle Estate & Gardens. 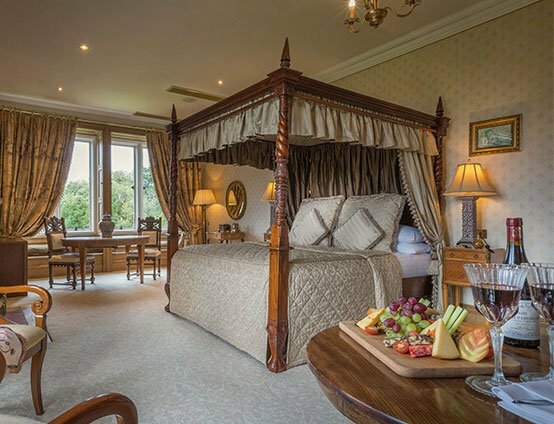 Enjoy one nights overnight accommodation with Full Irish Breakfast in the luxury surroundings of Lough Rynn Castle Estate & Gardens. Avail of this exclusive offer - 1 nights luxury accommodation with Dinner in the 2AA Rosette Awarded Sandstone Restaurant plus Breakfast the following morning. Relax in Peace and Tranquillity. Sit back, relax and unwind in the way only a magical Irish castle can accommodate with two nights of luxury including one delicious dinner in the award-winning Sandstone Restaurant. Friday/Saturday nights inclusive of Full Irish Breakfast and an Evening Meal in the Award Winning Sandstone Restaurant. Relax in the luxury surrounds of this magnificent Castle Hotel. Offer includes 2 nights B&B + Dinner + Afternoon tea. Spoil yourselves with two special nights of luxury and never go hungry with an unforgettable full Irish Breakfast on both mornings, one incredible dinner in the award-winning Sandstone Restaurant and one Afternoon Tea in the unique Lough Rynn Drawing Rooms. Enjoy all the luxuries of castle life including a full Irish Breakfast in the award-winning Sandstone Restaurant and Afternoon Tea in the scenic surroundings of the Lough Rynn Drawing Rooms. Stay with us 2 nights Sun-Wed and save yourself 12%. Stay with us 3 nights Sun-Wed and save yourself an additional 15%. The Cottages at Lough Rynn Castle Estate & Gardens are set within an easy 3 minute stroll from the Castle. These newly built luxurious three bedroom holiday homes accommodate up to five people. Here you will enjoy the wonderful setting and facilities of Lough Rynn in the comfort of a homely envoirnment.